Jimmy James, a hard working, funny, friendly, honest, loyal, extremely popular and good looking family man. Many would say that this sums him up. But under each of these headings, there's a list perhaps 20 miles or so (! ), long, which will tell you why he is each of these things. Sadly on 21st September 1995, after almost five years of a bitter fight against colon cancer, Jimmy passed away at the tender age of 50. Even while fighting the illness sport remained the most important thing to him. As the illness advanced and he could no longer run, his attention turned to golf from which he gained much enjoyment from. As we can already see, he hasn't, and never will be forgotten. And even though his life on earth with us is over, people still want to know what sort of a man he was and remains to be. His family was so important to him as it is to everyone. For my sister and I, he was the perfect dad. We got away with certain things, were disciplined when needed (just so mum wouldn't get upset that he was taking our side! ); he made us laugh and was our best friend. For our mum, a life companion who always seemed to make things good no matter how bad they were. Where his friends were concerned, these people were so important to him. If they needed him for anything, he was there like a shot. A party would not be the same without him, and at every party that he should be attending now, he is always mentioned for his jokes or what he would be doing at that moment in time. Probably getting his guitar out…. And never putting it away again. That was always one of our favourites!! When Jimmy James entered any room, the atmosphere could be lifted in a second whether it was already high or not. He had an unbelievable influence on peoples' lives whether they realised it or not. To those of you who didn't meet him, it is a shame that you didn't get the chance, but I feel that his personality rubbed off on anyone who met him and they will pass it on to you. When Paul asked me to write a few words about the kind of person Jimmy James was, it was difficult, because there's no amount of words in the English language that could describe exactly how much of an amazing person he still is to all the hundreds of people whose lives he touched. Tony Apicella, Andy Deighton, Rita Diffley, Jim Diffley, Ted Baker, John Taylor. 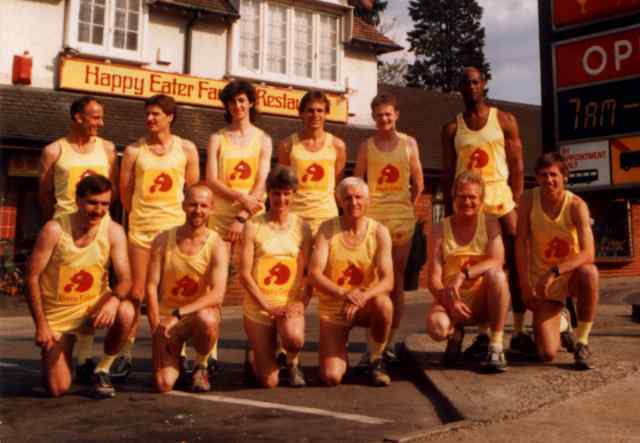 In 1987 the Happy Eater sponsored Reigate Priory AC in return for wearing this yellow kit while running the London Marathon. The photo call was assembled one afternoon prior to the marathon with all of the Priory contingent who were running in the marathon that year. 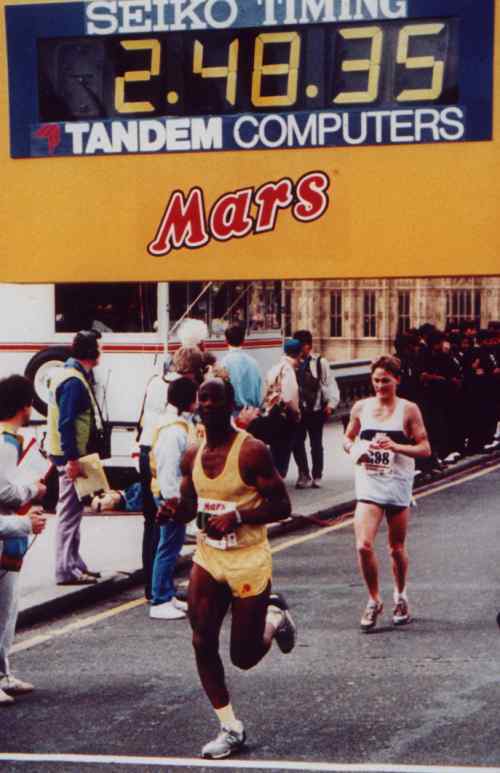 Jimmy won the Marathon Magnum this year, the magnum being a bottle of champagne given by Frank Golding (a member at that time) for any Priory runner who broke the three hour barrier.